New Delhi: The issue of legible and generic prescriptions by medical practitioners will now become a court concern after an advocate dragged the Medical Council of India (MCI) and Central Government demanding strict compliance of the regulations. A PIL has been moved in the Delhi High Court seeking directions to the Centre and the Medical Council of India (MCI) to ensure that doctors prescribe medicines by writing their generic names legibly and preferably in capital letters. The petition seeks strict compliance of regulation 1.5 of the Indian Medical Council (Professional Conduct, Etiquette and Ethics) Regulations, 2002, which mandates every physician “prescribe drugs with generic names legibly and preferably in capital letters”. The plea by Amit Sahni, a lawyer by profession, contends that MCI in 2017 had directed all medical practitioners registered under the Indian Medical Council Act to use generic names, but unfortunately no one takes it seriously. The plea has said that under PMBJP, launched in 2008, generic medicines were supposed to be made available at affordable price. Sahni has sought directions to the government to set up generic medicine shops under PMBJP near all super speciality hospitals in the country. “The doctors do not prescribe generic drugs generally and not done even on specific demand, due to vested interest,” the petition claimed. Medicine has become a business now a days, In order to make up for the money spend in educating themselves and setting up their clinics/hospitals, they loot the money from the patients. I’m not talking about everyone but most of the doctors do it in my opinion. There’s atleast 1 high cost tablet in every prescription we get these days. Not sure if it right for our body or right for their pocket. Hope this law gets passed. Every product produced in the world is having it\’s own quality, may be it is Medicine or Motor Car or textile.Can a Benz car be sold in the price of Maruti Alto? Simply claiming that all Generic medicines and Other branded medicines are of same quality is just turning a blind eye towards reality.It it is so Government shall instruct all Pharmaceutical companies to market all medicines in Generic names and the same shall have the same price tag irrespective of manufacturer.I am sure that all well known companies shall have to shut down their business in India and go else where, then we will get cheap Third grade medicines in India.It has become a norm to blame Doctors for every thing .Writing in Capital letters? How many Judges and Bureaucrats do that.How many Doctors in India has the luxury of that much time.Many work 10 to 14 hours per day if not more.When we buy medicine for our close relatives,we ask for the best available in the market, just we cannot have double standards. For your knowledge, the companies which are manufacturing generic medicines includes those ones also which are manufacturing same drug with a patent,so no question of third grade medicine as every medicine has to get an approval before mass production. Everyone demands and deserve best medicine but at affordable price,generic is the answer. For ur knowledge, generic n patent r different. Pls improve ur knowledge b4 talking with expert\’s.. Else better keep quite. You just need to follow your own words before writing anything else next time. Good luck to you with that zero level of knowledge. For your knowledge as well. There are fly by night pharmaceutical companies which do not indulge in drug recalls the way major pharma companies do, including those who manufacture generic medicine. The drug is already approved by FDA, so drug license may not be an issue. Bioavailability of the drug i.e. the way the drug is released in the body maybe an issue with these fly by night pharmaceutical companies. Branded Generic Medicines are preferred for costs and accountability of the pharmaceutical companies, personally should be the answer to help affordable quality medicine reach the needy. Each and every batch manufactured by each and every company isn\’t sent to FDA for testing. On a related note, the below section may or may not apply to you. Somehow spending thousands of rupees on food and drink over years is not a problem for people, but when it comes to the consequences of the same, treatment is expected either free / cheap / discounted. If the level of trust in your doctor is so low, then why seek treatment, let nature take it\’s course. Either you will survive or die, both ways are free and independent of that unscrupulous doctor who drains you of your hard-earned money by taking commissions from laboratories, pharmaceutical companies, your postman, your paperboy, your milkman and anyone else willing to give the filthy rich doctor money. Please have some faith in your doctor, he / she is also human like you. Like you have flaws, they may too have a few. If you expect God, then may He treat you. Doctor I agree with you when you ask for my confidence in you but not everyone in this country is able to afford it,that\’s the reality,that\’s the problem. Simultaneously at my place there exist good amount of doctors practicing generic medicine wherever they can,you misunderstood me if you think I am against the branded ones,but I am against the scientifically unproven propaganda spread by a few doctors all across the web. I design pharmaceutical plants and let me assure you one thing,the problem is made by some wasted interests. Period. 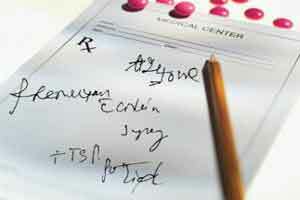 In my experience, drug prescriptions written by many private private medical practitioners are usually not readable. Many times I could not verify the drugs previously recieved by the patient simply because I could not read what was written by the other doctor who saw the patient before. The insurance companies and the government should start recognising only those hospitals where drugs are prescribed through typing/computer showing the details of dose,frequency,relation to food, generic name of the brand prescribed whether in OP or IP. If any case is filed against any doctor by the aggrieved patient alleging negligence or wrong treatment, then it will be very difficult for the doctor to defend himself if lawyer/judge can not read what actually was written in the prescription form.